Posted October 31st, 2005 by Ms. Jen & filed under fun stuff. Photo taken by Ms. Jen’s Nokia 7610 on Tues. 10.25.05 at Club Conradh na Gaeilge. 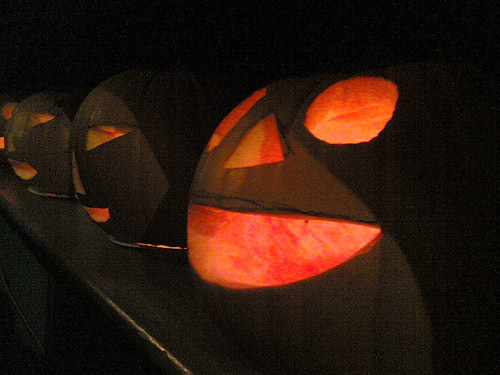 Happy Halloween or New Year’s Eve! I am off to a soggy hike at Glendalough today and there is a possiblity that I will be going to see a psychobilly band tonight. Possibly. Update: Glendalough = amazing. Mountain/Cliff trail (Orange trail) = Evil. Too exhausted to do anything but make a sandwich for dinner, take a shower and be in bed by 9:58pm with the lights off. Yikes! Posted October 30th, 2005 by Ms. Jen & filed under ah, ireland. Photo taken by Ms. Jen’s Nokia 7610. Thurs. 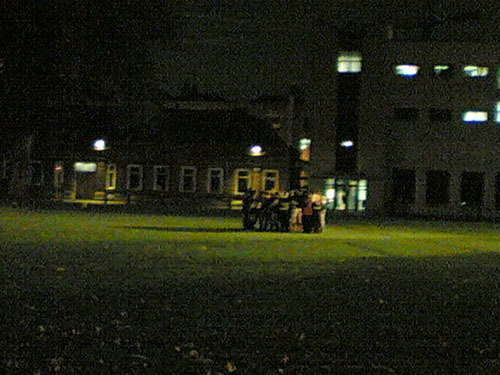 10.27.05 – A huddle on the Trinity College rugby field with the 19th cent. engineering building in the background. Any family reading this: the one story brick bbuilding in the background is where (Great) Grandpa G.F.K. went to classes when he attended Trinity in the 1890s. I found out today that I can go to the Records office and get a copy of his attendance record. This should be *interesting*, I will bring it back at Christmas. Posted October 30th, 2005 by Ms. Jen & filed under Uncategorized. Sat. 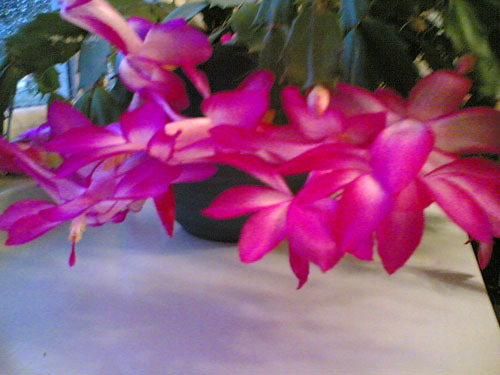 10.29.05 – A blooming succulent in the front window at Christine’s house. Posted October 28th, 2005 by Ms. Jen & filed under ideas + opinions. Something tells me that in her Irish use of the word that Ballybebackwarks is about the inhabitants state of mind and could be next suburb over rather than unpopulated, little town a day’s drive a way. Fellow(ess) americans help me with the word in common usage, when you say ‘boondocks’ or ‘BFE’ do you mean a distant sparsely inhabitated place or a rural place with backwards inhabitants? 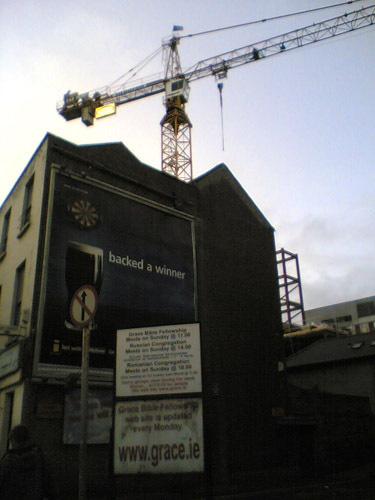 More Cranes, this time with Jesus and Beer! 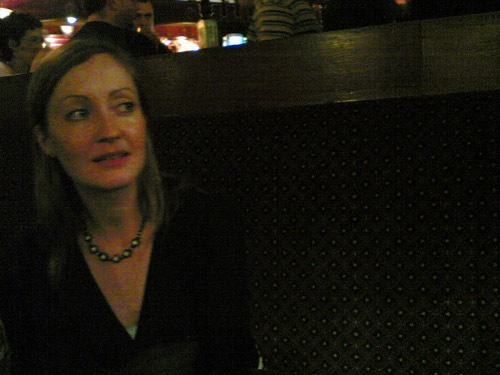 Posted October 28th, 2005 by Ms. Jen & filed under ah, ireland. 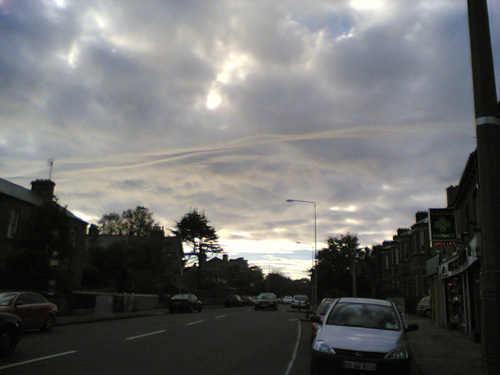 Sat 10.22.05 – The sky walking back from Rathmines center. Ok, lest anyone fool you, the weather here in Ireland is not that bad. There have been more dry days than wet and a good 50/50 of sun to cloud. Now, mind you, the sun to cloud ratio will flipflop at least four times in one day, but there is sunshine. The last week has been in the upper 60s (F degrees) and I have not really needed my coat. I have worn short sleeves several days now and you can pick out the rest of the American crowd by who is wearing shorts and flipflops. The Irish remain optimistic that real winter will show up any day now, as they are wearing full coats and scarves, even as the temp is nearing 70 degress F (21 C). But the best part of the weather here in Ireland has been the sky. Moment by moment it is to be watched as it is an ever changing light, cloud and color show. 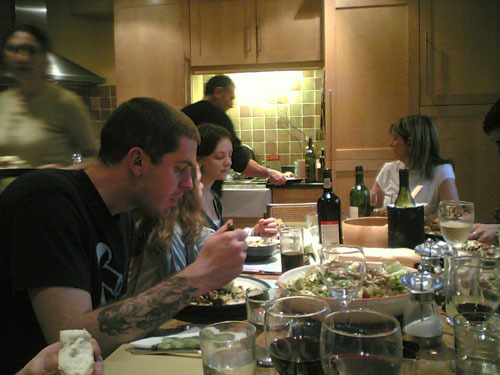 Posted October 28th, 2005 by Ms. Jen & filed under photos + text from the road. Fri. 10.21.05 – At Maffey’s with my classmates.